A Senate Republican expressed concern last week that U.S. taxpayers may not get the full value for their 61% stake in General Motors should the automaker go ahead with its initial stock offering, papers for which are expected to be filed any day now. In a letter to the White House "czar" overseeing the government's troubled asset relief program (TARP), Iowa's Charles Grassley asked if Treasury and GM "are taking the steps necessary to ensure that the IPO results in the highest possible return for the American taxpayer." 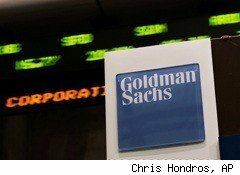 Grassley might be happy to know that a step taken by Goldman Sachs (GS), which is playing a smaller role than that of its rivals in the IPO, has substantially reduced the amount banks stand to make on the deal. In May, Goldman offered to accept a 0.75% fee to underwrite the IPO, Bloomberg reports, citing anonymous sources for the information. That's a fraction of the 3% fee banks typically charge on the largest IPOs and well below the 2% offered by Bank of America (BAC) and other banks that presented to Treasury, the sources said. Goldman Sachs, which has just been sued for fraud by federal regulators and has ties to GM competitor Ford Motor (F), didn't get a top role in the IPO. The government nonetheless imposed the fee pitched by Goldman Sachs President Gary Cohn and his five-person team on all underwriters, angering the banks, people familiar with the matter said. That other banks, which include JPMorgan Chase (JPM) and Morgan Stanley (MS), are furious at Goldman isn't surprising, Samuel Hayes, professor emeritus at Harvard Business School told Bloomberg. "They feel it gave the government a real lever to force down fees on the underwriters. But the deal still has a lot of marquee value." Beyond the prestige of conducting a GM offering, the banks still stand to make $120 million on the deal -- although, if Goldman hadn't pitched its discounted fee, they could have made four times as much.